This week, Destructoid is sponsored by Marvel Puzzle Quest. We sat down with Josh Austin, Marvel Puzzle Quest’s senior producer at D3 Go!, to answer our burning questions! 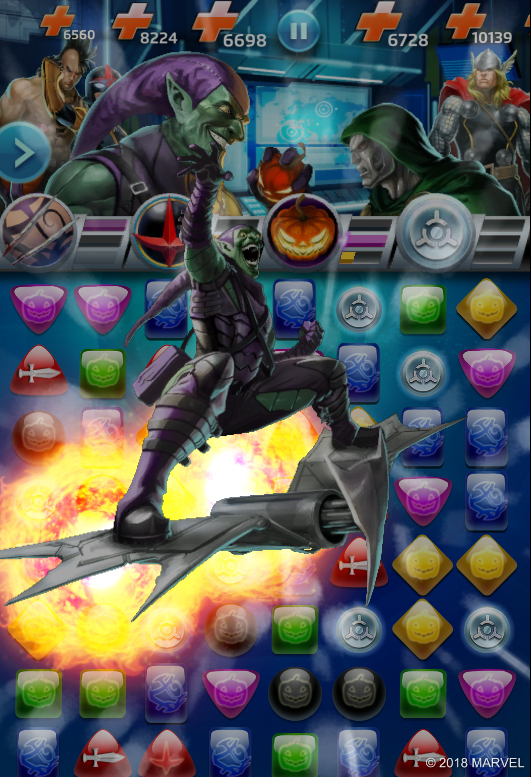 Josh: Marvel Puzzle Quest may look like just a puzzle game with Marvel characters in it, but there is a lot of deep strategy in the game. The game has RPG elements with the characters you collect, both heroes and villains, leveling them up and finding synergy with the three teammates you choose to go into battle with. Each hero or villain has three powers and finding comics in the game for that character increases their power or ability and allows the player to raise their overall level. Doing so deals more damage when matching tiles in the puzzle board and increases the power of the ability. Dtoid: Can you give us an example of how the RPG elements work, like character progression? Josh: As the player progresses, it becomes more important to find a team of characters that play off each other’s abilities. One of my favorite team combos for clearing out enemies in story events is Thanos (The Mad Titan), Black Panther (Civil War), and Doctor Strange (Sorcerer Supreme) because Thanos has a “Court Death” ability that means when anyone on the enemy team dies, Death comes out and does massive damage to whoever is left. However, this helps trigger Black Panther’s “Move… or be Moved” ability where he leaps away from the fight for a turn, then he jumps down slashing an opponent, which usually kills someone and starts both of these attacks again. And Doctor Strange is great because every time the enemy triggers an ability, he reacts using “Flames of Faltine” to damage the enemy even on their turn! Dtoid: Is the game based on the comic books or the Marvel movies? Josh: The core of the game is comics, hence the comic books and much of the character history, but we have also incorporated many of the cinematic stories. We find ways of releasing content for everything from a new comic event for publication, to movie events and television shows for the many different places Marvel releases their content. Recently we released Jessica Jones for Season 2 of Netflix, we also went big for Black Panther that included a story event, two characters, and we are still not done visiting Wakanda in the game! Sometimes we release two characters. For someone like Doctor Strange, when the movie came out, we released a 5-Star classic comic version for the fans of the comic world of Doctor Strange. 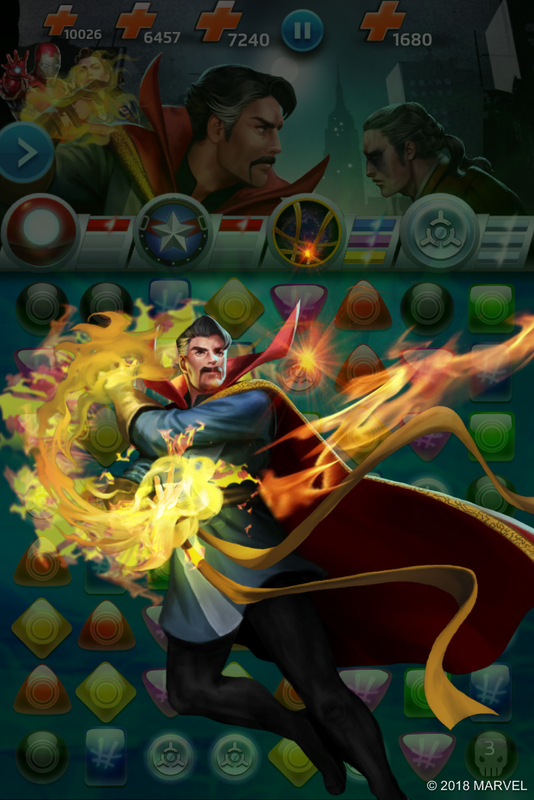 At the same time, we also released a 3-Star Doctor Strange that was based more on the movie. Dtoid: We're fans of the original. How has it changed over the years? Josh: The game has changed over the years by adding more features to expand the world, and many more characters from 1-Star to 5-Star. We tried to listen to the community and find ways to address areas that needed changes with the large amount of content coming out over the years and even adding more things to make story and tournaments (PVP) more fun for the players. As the game grew, more story events were added with different features like Gauntlet Mode, Lightning Rounds, and more that offer different ways of playing. PVP was added where the player faces AI controlled versions of another player’s team. What this means is, a player will go into a PVP event, play as their favorite and most powerful team and other players have to beat that team structure. If an opponent beats their team, they have the chance to go in and try to beat whoever took the node. new character or strengthen a character already in their roster. We also added Alliances, which is a way for players to join a collection of other players and chat with them in game (without having to give personal information out) to talk about strategies, and even compete in special Alliance-only events to earn even more rewards. 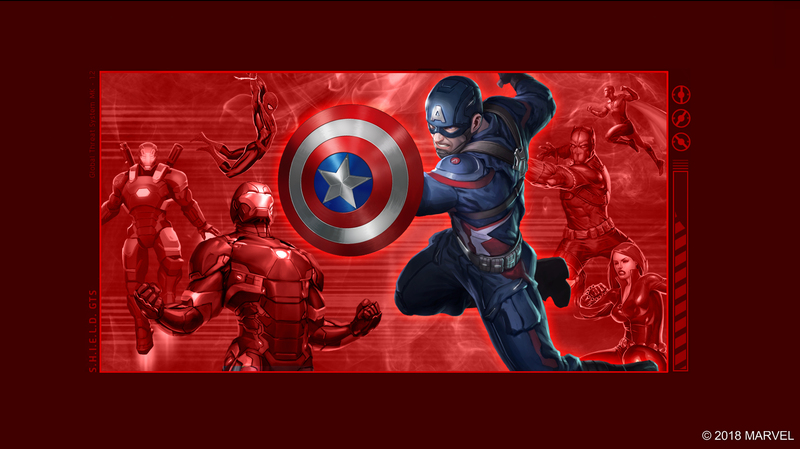 Dtoid: How involved was Marvel, and how do you decide which heroes to use? Josh: We review each character, not only as long-time Marvel fans but also researching their abilities based on how Marvel is using them, then we write out the powers and decide the star level. After we have written out the paper design and sketch out the art, we work with Marvel to make sure the characters are in line with how they designed them. It’s a collaborative effort with all teams involved, and it’s great to work with Marvel as we get designs, videos and more to help with character creation. Dtoid: So, which characters are the most popular? Josh: The most popular characters lately have been Captain Marvel (Carol Danvers), Red Hulk (Thunderbolt Ross), Iceman (All New X-Men), Vulture (Adrian Toomes), Grey Suit Black Widow, Thanos (the Mad Titan), Doctor Strange, both Modern and Sorcerer Supreme, Rogue (Classic), Gambit 3 and 5 stars, Black Widow (Grey Suit), and Jean Grey (Phoenix). Sometimes we have a character that is so good we have to rebalance them so other characters have a fighting chance and keep the game fair for everyone. One of those characters was Wolverine (Old Man Logan), he was so powerful and so he was reduced a little. He’s still a very popular character with his ability to heal and deal damage, he’s a devastating 5-Star character! Dtoid: And what about with you and the team? Are there any characters that you would personally really want to add to the game? Josh: The team has been itching to add Cable to the roster, and a new version of Juggernaut would be great as he’s a powerful 1-Star and needs to be improved. We’d love to get the Skrulls in the game as a new enemy variant, and add an adult version of Iceman since we have the kid version in the game right now. Personally, I would also be really be happy to get Sabertooth in the game someday. Of course, there isn’t a date set (or even concept art created) for these but we know players would be excited for the introductions of these characters. Dtoid: Ok, one last question. Can we get any freebies for the community? Josh: Uh, the game is already free (laughs) but yes, we can get your readers some buffs. We'll hook you up. Thanks Josh for your time and to D3 Go! for covering our bandwidth and other vices this week. You can download the full version of Marvel Puzzle Quest with a Level-3 Thanos unlocked using this link. If you try it let us know what you think of the game in the comments below!